A Leeds-based social enterprise which promotes better mental health through growing fresh produce is going from strength to strength after establishing an indoor farm at Unity Business Centre in Chapeltown. Using a process known as hypoponics in which plants are grown in sand, gravel, or liquid rather than soil, Growing Better remains sustainable by selling its impressive range of healthy micro greens and shoots – including basil, broccoli, pea shoots and celery leaf – on the open market. Customers can also purchase a starter grow kit which includes commercial grade seeds and hydroponic grow pads together with a tray and lid. Rob Moores, founder and chief executive of Growing Better, said: “We aim to provide a supportive environment for people coping with mental health challenges, and there is lot of evidence which shows that growing produce can lead to better mental health. “Our indoor, hydroponic vertical farm at Unity Business Centre is a first-class facility. We share the building with many other fledgling businesses which enables us to exchange ideas and take part in on-site seminars and other enterprise-focused events. Unity Business Centre is one of three sites in Leeds operated by Unity Enterprise, a subsidiary of Unity Homes and Enterprise, which collectively provide 130 managed workspaces for around 80 businesses, social enterprises and third sector bodies. 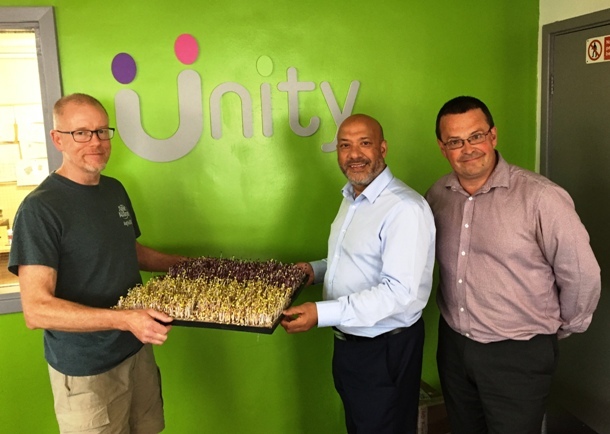 Adrian Green, Unity Enterprise manager, said: “We were delighted to welcome Growing Better to Unity Business Centre and follow their progress very keenly. “Rob and his team have brought fresh thinking – as well as fresh produce – into the exciting and dynamic environment that our clients enjoy across all three of our centres. This atmosphere of boundless positivity has enabled an ever-increasing number of inner city enterprises and voluntary sector organisations to grow and prosper. Ali Akbor, Unity Homes and Enterprise chief executive, said: “Unity Enterprise was set up in 2000 to complement the work were already doing to improve local communities through the provision of high quality, affordable homes. “Helping people to help themselves by increasing employment opportunities and promoting social inclusion via business activities is at the core of our work. Growing Better is an excellent recruit as we strive to continue meeting these objectives.